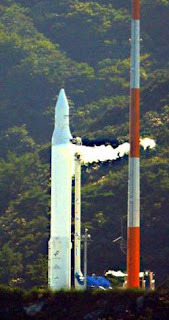 Last week Korea attempted to launch its first rocket (the Naro or KSLV-1) but the launch was cancelled a bit after 8 minutes before launch. I liveblogged the events then and will be doing so today as well when they attempt to launch it again. Update: the launch was a success! I'm continuing to watch reactions to the launch so the area below will continue to be updated. 8:00 pm: Uh oh, looks like the satellite wasn't sent into the correct orbit as they had suspected before. The launch and separation was a success but the orbit seems to be too high, at 342 km instead of the planned 306 km. We still have to wait ten more hours before communication with the satellite is established as well. 6:20 pm: We have YouTube! Here's the launch. Note that this is a different channel from the one I was watching (SBS), so no Yi So-Yeon talking here. 6:00 pm: I mentioned that this makes Korea the 10th country to have its own launching capability. The others are: Russia, United States, France, England, China, Japan, India, Israel, and Iran. 5:45 pm: Three more images of the launch can be seen here, here, and here. Edit: and an especially nice one here. One more here. 5:35 pm: Still waiting for an embeddable video but if you don't mind Windows Media Player format you can see the launch here. 5:30 pm: Naver (Korea's Google or Yahoo!) has changed its logo to the one on the right. You can see a picture of some people watching the launch from an article here. T+24:00: Since there are no cameras attached to the rocket they're just watching the launch over and over again and talking about what the success will mean for Korea. Until 13 hours from now when the satellite makes contact there shouldn't be any more updates, but hopefully a video of the launch will be uploaded soon. With nothing left to talk about the broadcast has just ended. I'll continue to keep an eye on reaction to the launch though. T+17:15: Talking about the seven years it has taken to get to this point. This first rocket is a smaller one than later versions they have planned. T+13:35: Yi So-Yeon is wiping away tears. T+10:30: The announcers seem a bit surprised by the speed of the launch and the separation of the satellite. They're also talking about the implications of the orbit possibly being too high. First communications with the ground from the satellite will take place in 13 hours from now, which is when we will be completely sure that everything has been a success. T+9:45: The satellite has separated from the rocket. T+9:00: The rocket launch is now officially a success. T+7:50: Apparently has just entered into its desired orbit...I think. Might be a bit higher than expected. T+6:40: Second stage has just begun to fire. T+5:30: Heh, they got the VIPs to clap again so that they could take a picture. They missed the photo of the spontaneous clapping. T+4:35: Fairing has been successful and everybody's clapping. The TV subtitles are announcing it as a success but we still have to wait. T+3:00: Fairing to happen soon. T+2:00: This rocket doesn't have a camera on the side like the Falcon-1 does, so not quite as interesting. T+1:00: Smoke cloud behind the rocket is quite small, very unlike a shuttle launch. T+0:55: Just passed Mach 1, altitude 10 km. T+0:30: Up it goes....nobody is talking. T-0:30: Time to be nervous. 4:58 pm: All the cables have been removed from the rocket, charging the first (bottom) stage of the rocket now. If this launch succeeds Korea will be the 10th nation to have its own launching capability. 4:57 pm: Everyone's nervous and optimistic. No problems at all so far...announcements in Korean and Russian. 4:55 pm: Five minutes left, the top stage of the rocket is now being charged. 4:54 pm: No more oxygen plume from the side of the rocket. 4:52 pm: We just passed the time where the launch was shut down last week (T-7:56). Now T-7:30. 4:51 pm: A radius of 25 km around the site has been completely closed off to sea, air traffic etc. Lots of people on the beach like last week gathered to watch the launch, waving flags. 4:50 pm: Ten minutes left. Not a cloud in the sky, by the way. 4:48 pm: Talking about the Russian engineering team also working on the launch - apparently they've been in Korea for over a year straight for this launch. The Russian side was much less nervous about the launch cancellation last week, whereas the Korean engineers were understandably more nervous. It's their first time, after all. 4:47 pm: A lot of the VIPs are leaving the room now because they want to see it with their own eyes instead of from the seats given to them inside where the view is little different from what anyone can see on TV. 4:45 pm: Automatic launching sequence has just begun. As we saw last week it is capable of shutting itself off if a problem is detected, though manually shutting it off takes a bit of time. 4:43 pm: Announcement that all systems are go, and they're just about ready to start the automatic launching sequence. 4:42 pm: By the way, Yi So-Yeon (the first Korean in space) is here today as well, same as last week. Cellphone service in the area has been cut off. 4:40 pm: Twenty minutes left, and in four minutes they will five the final launch time confirmation and start the automatic launching sequence, which takes 15 minutes. 4:35 pm: Now showing the control centre with the nine screens and some two dozen or so staff members and VIP seats just behind them, separated by a glass screen. The white screen in front of the TV screens just went up and they're now explaining to the VIPs how the launch is going to work. 4:30 pm: Going over the facts again, such as how ignition will start 3.8 seconds before launch, what will constitute a successful launch, etc. 4:28 pm: The erector has been removed from the launch pad. 30 minutes left so everybody watching the launch is starting to feel nervous again. 4:23 pm: Just got home after feeding the cats and turned on the TV, no problems so far. More in a bit. 1:40 pm: Launch time confirmed for 5 pm today, no problems detected so far. 11:35 am: An article here says that launch time will be finalized at 1:30 pm. If there are no problems then countdown will begin 15 minutes before launch as before. We'll know whether the launch has succeeded about nine minutes after liftoff. While we wait, here's a map of the area again.